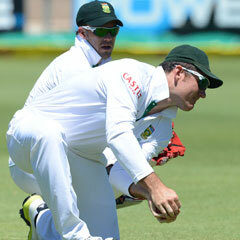 Check out all the pictures from the Proteas victory in the second Test in Port Elizabeth. Port Elizabeth - South Africa's ruthless demolition of New Zealand showed why they are ranked the number one team in Test cricket, both captains agreed after the hosts completed an innings win in the second and final Test at St George's Park on Monday. Fast bowlers Dale Steyn and Morne Morkel used the second new ball to devastating effect as South Africa won by an innings and 197 runs before lunch on the fourth day. It was their second successive innings win against the outclassed New Zealanders. "It's extremely disappointing," said New Zealand captain Brendon McCullum. "But there has to be an acknowledgement of the difference in class between the two teams. We weren't good enough but we were put under tremendous pressure by a team at the very top of their game." "We've been very professional," said South African captain Graeme Smith, who hailed the attitude and performance of his players in sustaining the level of play which took them to the number one spot when they won a series in England last year, which they followed up with a victory in Australia. "The guys have shown they are hungry to do well," said Smith. "After coming off two big series away it would have been very easy for us to idle along in these two matches but we haven't done that. "The bowlers have bowled with good pace, good aggression and good intensity and the batters have got runs." Man of the match Steyn took three for 48 for match figures of eight for 65 while Morkel took two for 36 as New Zealand were bowled out for 211 on Monday. They needed only a combined 34 deliveries to take the last five wickets. Dean Brownlie and BJ Watling put on 98 for the fifth wicket before Brownlie was caught behind off Jacques Kallis for 53 in the tenth over of the day. The new ball was taken three overs later and the rest of the batsmen folded quickly, with an early finish becoming inevitable when Watling was bowled by Steyn for 63. Smith said he was particularly pleased that Steyn and Morkel had excellent back-up, with Vernon Philander starring in the first Test, while Rory Kleinveldt took key wickets when Philander was ruled out of the second Test with a hamstring injury. "The thing now is that it is relentless," said Smith. "People can back each other up. It's not just one bowler and the batsmen being able to play through that and things ease up. We have guys who can keep coming all day." McCullum agreed with Smith's assessment of the fast bowlers. "I've never been challenged as consistently as that by a group of bowlers," he said. McCullum said New Zealand would have to learn from the experience of playing against the best team in the world. "They are at the top of their cycle of performance," he said. "They never let us into the game." The teams meet in three one-day internationals, starting in Paarl on Saturday, but then both face new Test challenges next month. South Africa are at home to Pakistan in three Tests while New Zealand will be hosting England. McCullum said he hoped Ross Taylor would be back after the former captain withdrew from the South Africa tour. He said Dean Brownlie and BJ Watling had shown their ability as batsmen in South Africa, adding that seeing off the new ball would be crucial against a good England bowling attack. "Pakistan will be a potentially tough series," said Smith. "They have an exciting bowling unit and some experienced batsmen."